During the 2017 presidential election following the exit of Park Geun-hye, candidate Moon Jae-in promised the relocation of the presidential office to the central Seoul location of Gwanghwamun from its secluded present position. A year and seven months after he won the election, President Moon scrapped the plan. His campaigners said Cheong Wa Dae was too big and its area too wide to serve as an effective workplace for the chief executive of the state. Compared to the White House in Washington, Elysee Palace in Paris and No. 10 Downing St. in London, the house with its blue roof-tiles is too detached from the everyday life of Koreans, they told voters. Cheong Wa Dae, or the Blue House, is situated on an area of 25 hectares, four times the home of the US president, and the forested hill of Bugaksan totally prevents access from three directions, barring the south. The two-story main hall for the president as the single occupant is about half a kilometer from the secretariat building. So, that particular campaign pledge had enough justification. Yet, it entailed one notable problem. Under the currently ruling Democratic Party of Korea, known for its laissez-faire approach to civil protests, Gwanghwamun has already become a shabby marketplace of social and political activism. One shudders to think of the president sitting in an office at Gwanghwamun surrounded by demonstrators from all kinds of groups with all sorts of demands and complaints. It therefore was fortunate that Yoo Hong-joon, who had led the study of presidential office at Gwanghwamun since the election, announced this month that the government would not pursue the project during the current presidential term. Actually, he made clear what was obvious from the beginning; there was no space available for a new presidential office and auxiliary facilities in the area between the Gwanghwamun Gate and the Gwanghwamun intersection. When Moon’s campaign revealed the Gwanghwamun office project, people thought of the next president just borrowing a few rooms at the existing Government Complex or Foreign Ministry buildings in order to get closer to the people. Then it made sense, considering the bitter consequence of Park’s self-imposed isolation deep inside Cheong Wa Dae. Yoo, former chief of the Cultural Heritage Administration, is a cultural historian, not an urban planning expert nor an architect. Yet, when he began a feasibility study of the relocation project with an ad hoc panel of experts, he soon confronted the problem of space. He was given the impossible mission of finding a way to move the entire presidential office complex along with at least the barracks for the presidential security force, a safe house and a heliport. President Moon understood the problem and agreed to ditch the plan, according to Yoo. I welcomed the decision but felt like I was being fooled. Reporters asked Yoo how so indiscreetly the campaign pledge was made regarding the important issue of relocating the presidential office although all the difficulties involved were obvious in the first place. He admitted to the absence of meticulous prior study as the party had to kick off an election campaign rather abruptly. The Moon Jae-in government got off to a hasty start, skipping the usual preparatory period of a transition committee operating for months after the election. So it lost the chance to eliminate some unrealistic ideas from election commitments, an excuse for the many trials and errors the administration has recorded since its inauguration. We have watched the serious fallout from the policy to phase out nuclear power generation and depend instead on new renewable energy. Whereas the Gwanghwamun presidential office has been abandoned, Moon would not make a concession as to the energy denuclearization program, which has effectively destroyed the nation’s industrial and technological foundation for the peaceful use of atomic energy. Yet, the reversal of the Gwanghwamun plan indicates the possibility for the president to review policy agenda proven unpopular with the electorate. His support rate has fallen to the 45 percent level, with the number of nonsupporters growing among the younger generations. With the 2020 parliamentary elections approaching, the ruling camp needs to sort out unrealistic, ideology-oriented policies that could accelerate public disenchantment with the incumbent government. In this age of the “fourth industrial revolution” and artificial intelligence, it is embarrassing to hear such a comment from a top presidential adviser. We wonder if by any chance Yoo’s remarks convey the misgivings of Moon, who must have deeply thought about the hardly enviable fates of some of those who had occupied Cheong Wa Dae before him. Some politicians are known to make contact with reputed feng shui experts to seek advice when they want to move the gravesites of their ancestors before running for an election. Such episodes only increase our distrust in the political community in general, as does Yoo’s revelation of shamanistic concerns. As to the ill luck of our former presidents, especially the three immediate past ones, we have a better analysis. Whoever have had the chance to visit Cheong Wa Dae and step inside its huge main building -- I had the privilege of eating a hot noodle lunch there once -- I invariably notice the unnecessarily ample space the designers in the late 1980s had wanted to symbolize power, instead of providing warmth and practicability. In the main hall, its master requires extra effort to avoid the loss of reality and to escape a fear of isolation. Now that the Gwanghwamun presidential office has turned out to be a ridiculous dream, we hope that an extensive “remodeling” of Cheong Wa Dae will be done to help ensure that our present and future chief executives can better communicate with friends, foes and tens of millions of neutral citizens. May God or the spirit of nature that the president and his aides hold in their belief help our nation live in better harmony, regardless the physical position of the power. 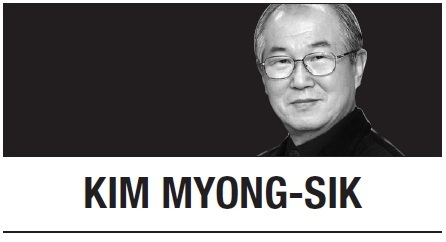 Kim Myong-sik is a former editorial writer for The Korea Herald. He served as head of the Korea Overseas Information Service during the Kim Dae-jung administration. -- Ed.